A powdery mix of metal nanocrystals wrapped in single-layer sheets of carbon atoms, developed at the Department of Energy's Lawrence Berkeley National Laboratory (Berkeley Lab), shows promise for safely storing hydrogen for use with fuel cells for passenger vehicles and other uses. And now, a new study provides insight into the atomic details of the crystals' ultrathin coating and how it serves as selective shielding while enhancing their performance in hydrogen storage. The study, led by Berkeley Lab researchers, drew upon a range of Lab expertise and capabilities to synthesize and coat the magnesium crystals, which measure only 3-4 nanometers (billionths of a meter) across; study their nanoscale chemical composition with X-rays; and develop computer simulations and supporting theories to better understand how the crystals and their carbon coating function together. The science team's findings could help researchers understand how similar coatings could also enhance the performance and stability of other materials that show promise for hydrogen storage applications. The research project is one of several efforts within a multi-lab R&D effort known as the Hydrogen Materials — Advanced Research Consortium (HyMARC) established as part of the Energy Materials Network by the U.S. Department of Energy's Fuel Cell Technologies Office in the Office of Energy Efficiency and Renewable Energy. This carbon wrapping was intended to prevent the magnesium — which is used as a hydrogen storage material — from reacting with its environment, including oxygen, water vapor and carbon dioxide. Such exposures could produce a thick coating of oxidation that would prevent the incoming hydrogen from accessing the magnesium surfaces. But the latest study suggests that an atomically thin layer of oxidation did form on the crystals during their preparation. And, even more surprisingly, this oxide layer doesn't seem to degrade the material's performance. "Previously, we thought the material was very well-protected," said Liwen Wan, a postdoctoral researcher at Berkeley Lab's Molecular Foundry, a DOE Nanoscale Science Research Center, who served as the study's lead author. The study was published in the Nano Letters journal. "From our detailed analysis, we saw some evidence of oxidation." Wan added, "Most people would suspect that the oxide layer is bad news for hydrogen storage, which it turns out may not be true in this case. Without this oxide layer, the reduced graphene oxide would have a fairly weak interaction with the magnesium, but with the oxide layer the carbon-magnesium binding seems to be stronger. "That's a benefit that ultimately enhances the protection provided by the carbon coating," she noted. "There doesn't seem to be any downside." David Prendergast, director of the Molecular Foundry's Theory Facility and a participant in the study, noted that the current generation of hydrogen-fueled vehicles power their fuel cell engines using compressed hydrogen gas. "This requires bulky, heavy cylindrical tanks that limit the driving efficiency of such cars," he said, and the nanocrystals offer one possibility for eliminating these bulky tanks by storing hydrogen within other materials. The study also helped to show that the thin oxide layer doesn't necessarily hinder the rate at which this material can take up hydrogen, which is important when you need to refuel quickly. This finding was also unexpected based on the conventional understanding of the blocking role oxidation typically plays in these hydrogen-storage materials. The models that Wan developed to explain the experimental data suggest that the oxidation layer that forms around the crystals is atomically thin and is stable over time, suggesting that the oxidation does not progress. The analysis was based, in part, around experiments performed at Berkeley Lab's Advanced Light Source (ALS), an X-ray source called a synchrotron that was earlier used to explore how the nanocrystals interact with hydrogen gas in real time. Wan said that a key to the study was interpreting the ALS X-ray data by simulating X-ray measurements for hypothetical atomic models of the oxidized layer, and then selecting those models that best fit the data. "From that we know what the material actually looks like," she said. While many simulations are based around very pure materials with clean surfaces, Wan said, in this case the simulations were intended to be more representative of the real-world imperfections of the nanocrystals. 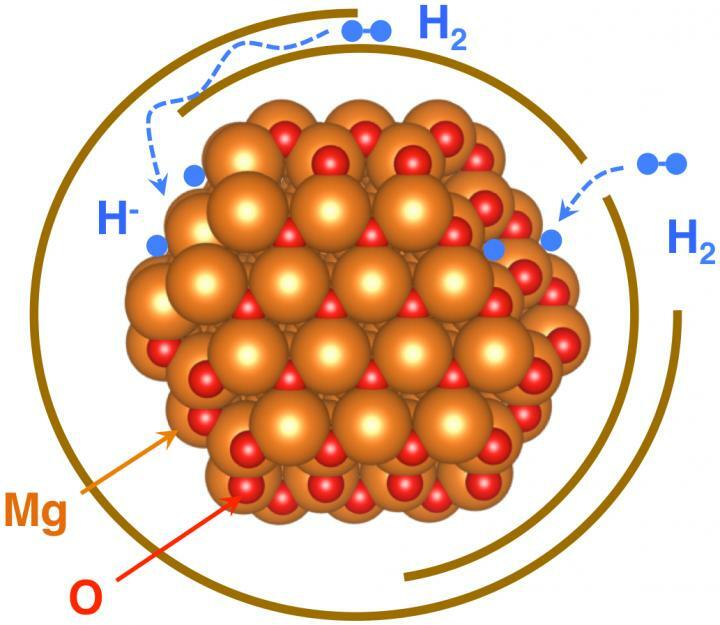 A next step, in both experiments and simulations, is to use materials that are more ideal for real-world hydrogen storage applications, Wan said, such as complex metal hydrides (hydrogen-metal compounds) that would also be wrapped in a protective sheet of graphene. "By going to complex metal hydrides, you get intrinsically higher hydrogen storage capacity and our goal is to enable hydrogen uptake and release at reasonable temperatures and pressures," Wan said. Some of these complex metal hydride materials are fairly time-consuming to simulate, and the research team plans to use the supercomputers at Berkeley Lab's National Energy Research Scientific Computing Center (NERSC) for this work. "Now that we have a good understanding of magnesium nanocrystals, we know that we can transfer this capability to look at other materials to speed up the discovery process," Wan said. The Advanced Light Source, Molecular Foundry, and National Energy Research Scientific Computing Center are DOE Office of Science User Facilities. This work was supported by the U.S. Department of Energy's Office of Energy Efficiency and Renewable Energy's Fuel Cell Technologies Office.